We caught several nice redfish , snook, and trout today. 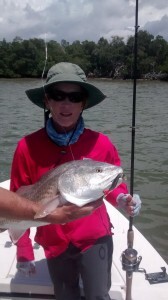 We were fishing north of Everglades city, near the buttonwood Bay Area. The 33 inch redfish in the picture, was caught on a rip tide jig that redfish, snook, and trout can’t resist this time of year. Give me a call,and let me get you out on the water and into the fish!